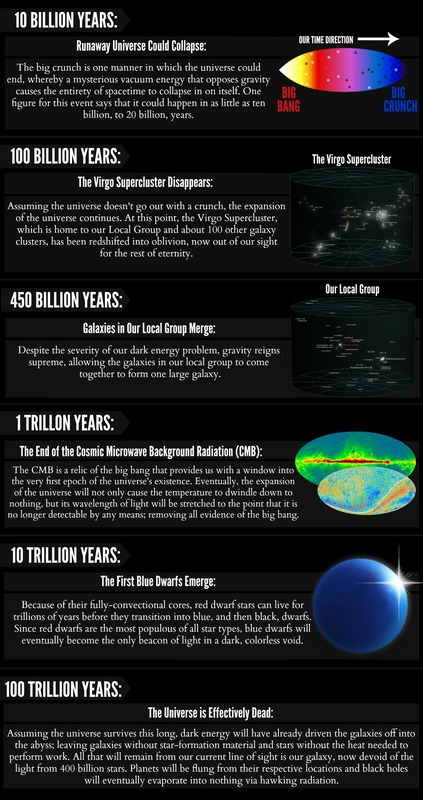 Here's what's in store for our universe in the next 100 trillion years. Telescopes allow us to study our surroundings, to see the cosmos and understand the laws of physics that gave way to the development of multicellular lifeforms. Telescopes are also time machines. 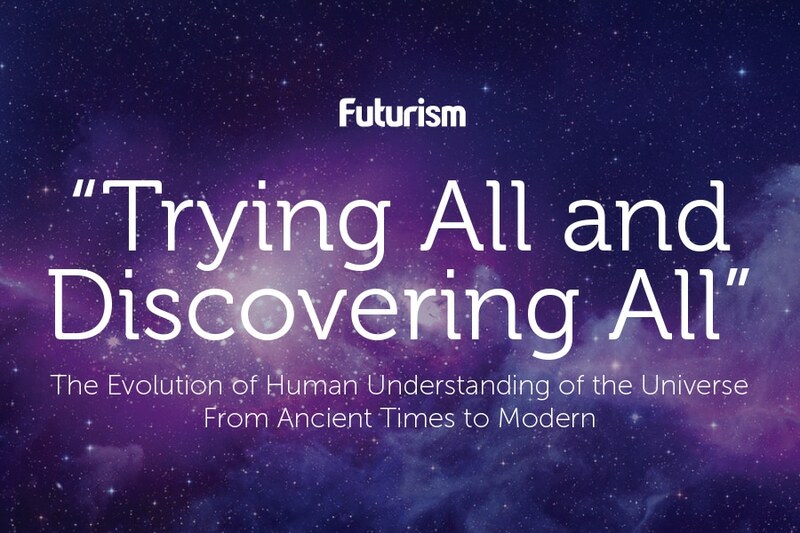 Through them, we can look back through the history of our universe and see some of the very first celestial objects that were birthed from the Big Bang. But telescopes allow us to see far more than our past. With them, we see our future. We can determine the rate at which the universe is expanding, see stars be born and die in equal proportions, detect changes in the atmosphere of distant exoplanets, and so much more. It has been said that, due to the accelerating expansion of the universe, the sky we’re observing today will look radically different from the one that’ll exist in a few trillion (or even billion) years. So, assuming the universe exists in a state similar to how it is now — without a big rip, big freeze, big bounce, big slurp, or any other cosmos-ending scenarios taking place — what will our descendants see when they look out into the vast reaches of the cosmos? Or rather, what will they not see? Here’s what the future has in store. Betelgeuse, also known as Alpha Orionis, is located approximately 640 light-years from Earth in the constellation Orion, and it’s one of the biggest and brightest stars in our galactic neighborhood. It could swallow our Sun 20 times over and emits over 100,000 times more light. If that doesn’t convey its sheer size, let me put it this way: If you were to replaced Betelgeuse with our Sun, Betelgeuse itself would extend all the way to Jupiter, engulfing Earth and all of the planets in the inner solar system. And the star is nearing the end of its lifespan. 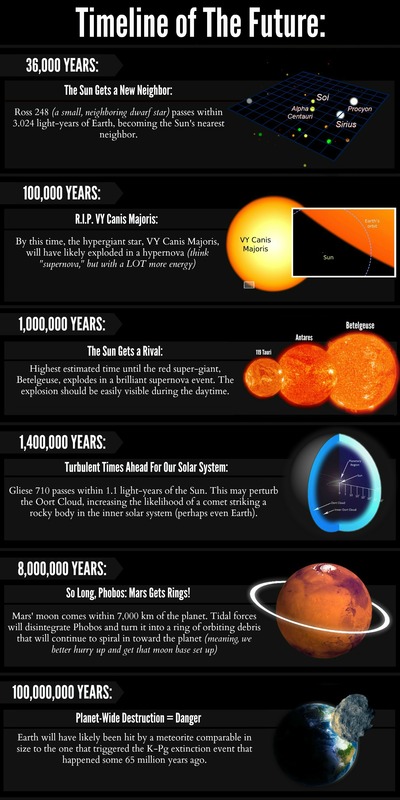 It’s estimated that Betelgeuse could go supernova any time in the next million years. Don’t expect the explosion to be noticeable immediately, though. It would take 640 years of traveling through the interstellar medium before the light made its way to Earth. 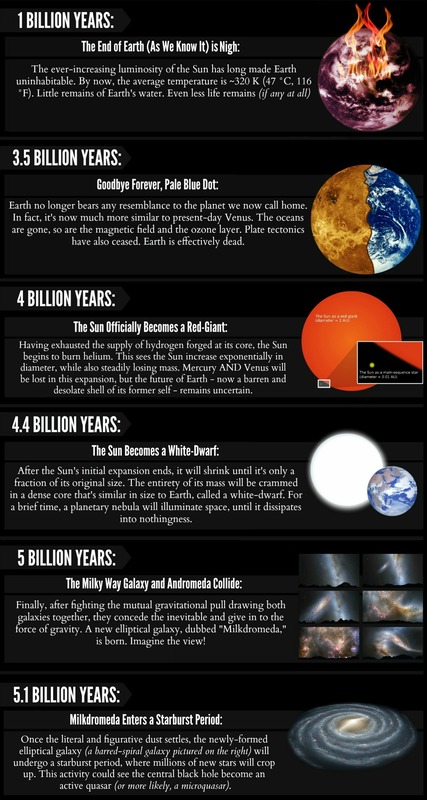 That means Betelgeuse could have already exploded hundreds of years ago, and we would have no way of knowing. When that light does arrive, the intensity of the supernova as seen here on Earth is the subject of debate, but some think that we will be able to see it during the daytime and that it will outshine the Moon at night. Models uncovered in 2010 say a rogue star could seriously upset the icy comets in the Oort cloud, a theoretical region located at the edge of our solar system. The star, tentatively known as Gliese 710, is an orange dwarf currently located some 63.8 light-years from Earth in Serpens constellation. It is relatively unremarkable, with only 60 percent of the Sun’s total mass and about 67 percent of its radius, but more recent simulations, undertaken by Vadim Bobylev from the Pulkovo Astronomical Observatory in St Petersburg, reveal that it could have a remarkable impact on us. While working on the Hipparcos Catalog (a project that aims to collect a myriad of data centering on an object’s speed, velocity, and trajectory), researchers located over 100,000 stars, a whopping 156 of which need to be monitored very closely as they might someday pose an imminent threat to mankind. It isn’t uncommon for stars to make an appearance at the outer end of a planetary system. In this case, however, the solar system in question is ours. In fact, it’s estimated that once every 2 million years, a rogue star arrives in our galactic neighborhood, which is defined as the area extending about 1 parsec (31 trillion kilometers/19 trillion miles) or 3.26 light-years from the Sun. The last of those rogue stars, Gliese 208, passed within four light-years of us about half a million years ago. Skip forward 1.4 million years in the future, and you’ll find there is an 86 percent chance that Gliese 710 will come within half a parsec of the Sun, a place where millions of comets roam. If the dinosaurs were still around, I’m sure they wouldn’t approve. Located approximately 9,400 kilometers (5,800 miles) from the center of Mars and about 6,000 kilometers (3,700 miles) above the planet’s surface is Phobos, one of Mars’ two natural satellites. The moon orbits its parent planet from a distance shorter than that of any other known moon in our solar system. Because of this short distance from Mars, Phobos completes one full orbit around the planet before it can make one full rotation around its axis. If one stood on the surface of the Red Planet and looked up, Phobos would zoom across the night sky in just under 4 hours and 15 minutes. A combination of the rather short orbital period of the small moon, its close proximity to the planet, and tidal interactions between Phobos and Mars is causing its orbital radius to decrease even further, which will eventually give way to one of two things. Either Phobos will break apart and form an intricate set of rings that could rival the ones that famously belong to Saturn, or Phobos will reach Mars’ Roche Limit, a region estimated to lie around 7,000 kilometers (4,350 miles) above the center of Mars or 6,200 kilometers (3,853 miles) above the Martian surface, at which point it will crash into the surface of Mars, acting as a giant nuclear bomb. You know the saying “Everything that lives must die,” right? One day, everyone you know will be gone, and then everyone they know will die, too. 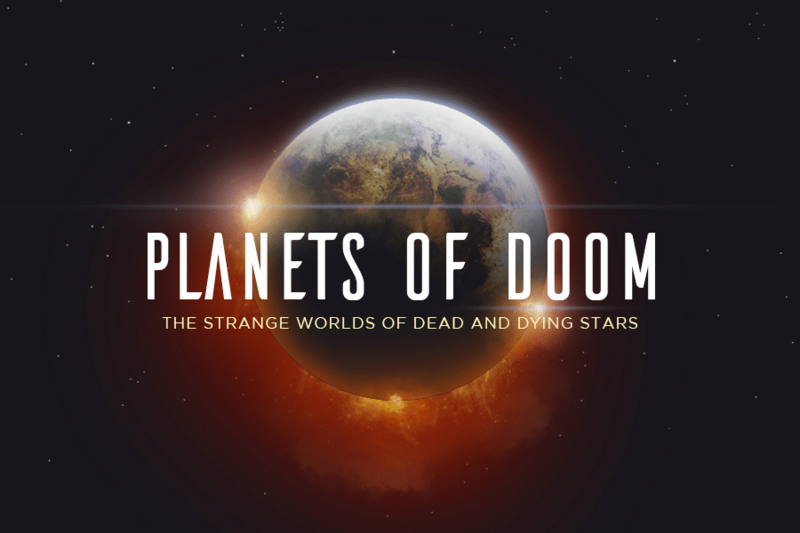 Our solar system and the universe itself aren’t immune to such things, though they meet their destruction on a much longer time-scale. Thankfully, before the Sun dies, the Earth will be gone, possibly swallowed up by the Sun as it transitions from a main sequence star to a red giant. 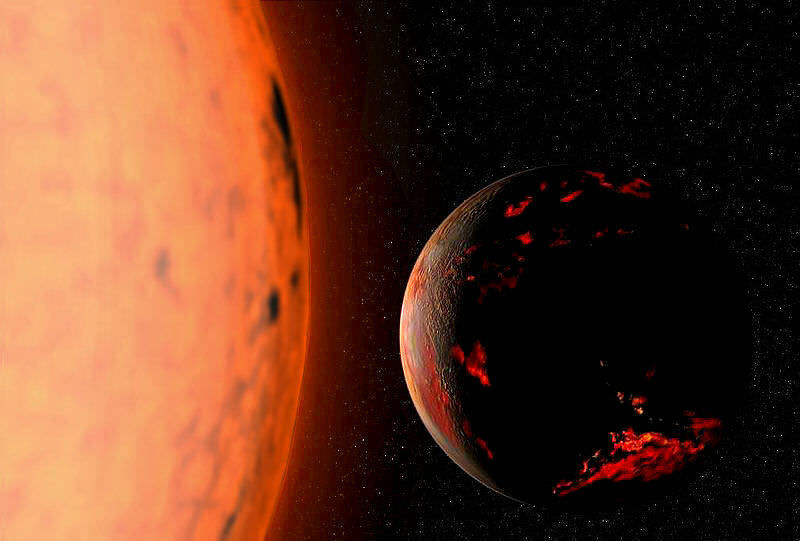 Regardless of whether or not Earth survives the Sun’s initial expansion, it will certainly be a fried hunk of rock that isn’t fit for human (or anything remotely similar) habitation. Long before those events occur, all of the water on the planet will evaporate, the rolling hills of green will wither away, and the atmosphere will be lost permanently to space, taking away life and any remaining semblance of the features that make our planet our home. If the surviving outer planets aren’t forced into wider orbits around the dying Sun, they might be flung from our solar system entirely. After that, some of the icy moons might see a glimmer of spring for the first time, allowing a small window of time to pass during which they thaw out and potentially become habitable. Our solar system can currently be found in the Orion spur of one of our galaxy’s spiral arms, situated some 25,000 light-years back from the central core, but after the merger, it is expected to be pushed back to about 100,000 light-years from the center of the galaxy. The central region of the newly-formed Milkdromeda will go through a drastic phase change of its own. The merger will inevitably result in the supermassive black holes from both galaxies combining to form an ultra-massive black hole with the combined mass of billions of Suns. Throughout the gradual process of this merger, which will take place over the course of hundreds of millions of years, it’s unlikely that any two stars or planets will collide. Yes, that seems strange, but remember that space is called space for a reason. The distance separating each individual star is incomprehensibly vast. Even the regions that are densely packed — like globular clusters and nebular clouds — are very spacious. However, new life is imminent. Along with absorbing all of the stars, planets, and black holes of Andromeda, the cache of the raw materials for star formation will combine, triggering the birth of hundreds of millions of new stars. All of our uncertainty about the event itself (and how much it will impact both galaxies as a whole) aside, there’s no doubt regarding the utter beauty our night sky will hold. After the merger is complete, the dust will finish settling, leaving behind scant evidence to suggest an epic merger took place at all. However, by observing white dwarfs and calculating their age (and their concentration of heavy metals), astronomers may be able to deduce the existence of an event that triggered furious star formation within the galaxy. Such an event could only be one thing: a galaxy merger. After an uncertain number of years, new star formation will halt altogether in the newly formed elliptical galaxy. Once the last remaining bits of material for star formation are gone, a galaxy almost entirely devoid of gas and dust will remain. Some of the material will be recycled when the first generation of stars produced in Milkdromeda explode as brilliant supernovae blasts, but at this point, our galaxy’s best days will be well and truly over. Moreover, some of the most famous far-off nebulae will be gone. Imagine a galaxy with no Orion nebula, no VY Canis Majoris, and no Pillars of Creation (granted, the Pillars might already be gone). It’ll be a very sad time, but perhaps the galaxy will construct even more elaborate nebulae in the wake of all we’ve already lost to time. 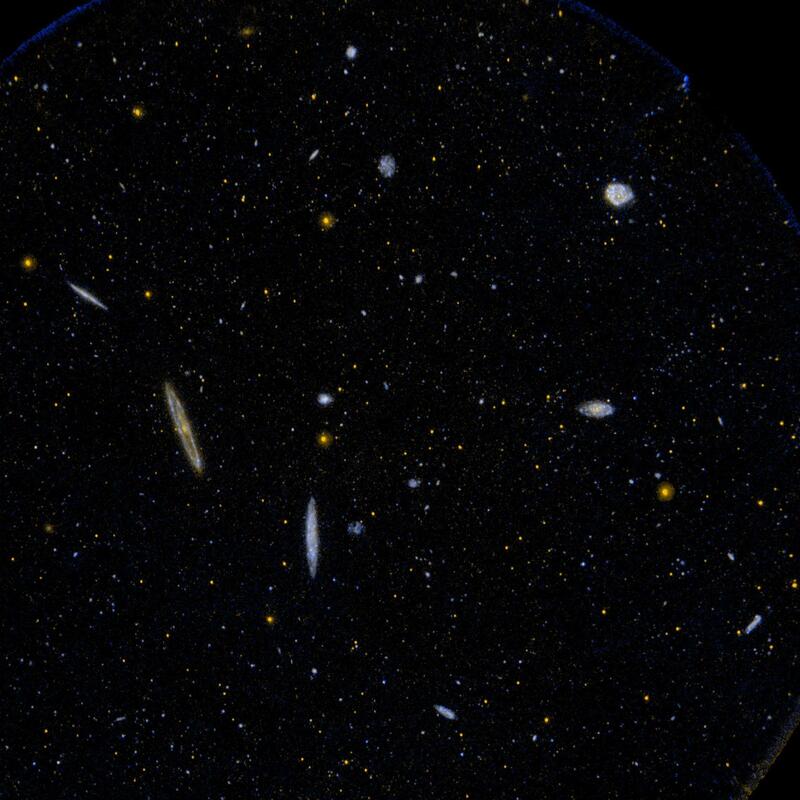 100 billion years from now, the ever-accelerating expansion of the universe — most commonly called dark energy — will cause all but 1,000 members of the Virgo Supercluster — where our galaxy, along with other members of our local group, reside— to red-shift into oblivion, never to be seen again by astronomers in our galaxy or any nearby. The visibility of galaxies located on the horizon of the observable universe at this point can be likened to light that’s captured by the event horizon of a black hole. As an object approaches the “point of no return,” its image appears to freeze and fade away because you can’t see any of the light it emits from that point forward. It is much too far away and is traveling way too fast to ever reach our corner of the universe, no matter how much time the light has to traverse spacetime. In a similar frame of mind, this period signals the regression of the universe. Instead of being diverse, colorful, and bright, as it is now, it devolves into the universe it once was long before Earth was even around: the cosmic dark ages. In a trillion years, evidence of the Big Bang in the form of the cosmic microwave background radiation, which was created a mere 379,000 years after the birth of the universe, will grow dim to the point of invisibility. From there, it will then be lost forever, perhaps leading future astronomers to believe the universe is static and unchanging. However, future generations may eventually discover the process of nucleosynthesis (the fusion of heavy elements from lighter ones) in the core of red dwarf stars, which are smaller, dimmer, cooler, and much more common than stars like our Sun. They employ an internal process that allows them to burn for trillions of years. 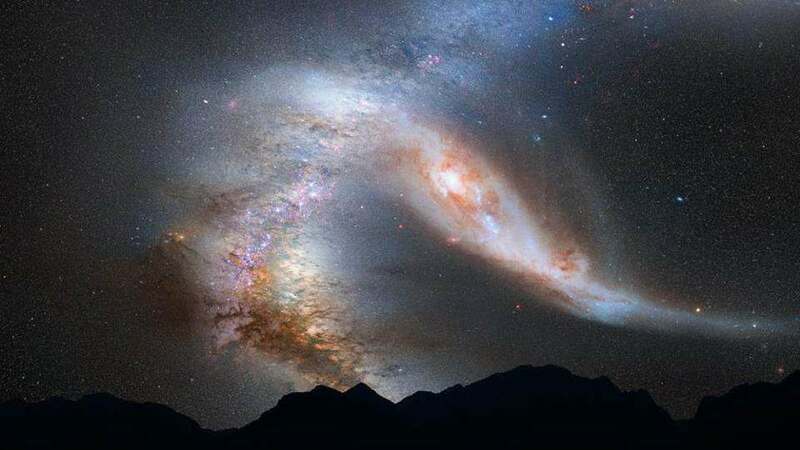 According to Avi Loeb from the Harvard-Smithsonian Center for Astrophysics, hypervelocity stars — or “true” shooting stars that only occur about once every 100,000 years — that are flung out of our galaxy at incredible speeds may be the answer to this particular cosmic quandary. These stars are usually the lone survivors of a binary or multiple star system that went awry. One of these stars can be ejected from its typical orbit after its partner is devoured by a black hole that has wandered too close to a galaxy’s center. When this occurs, the momentum of the dead star is then transferred to the partner, allowing it to break free of the black hole’s gravitational hold and speed off on a trajectory that takes it outside of the galaxy altogether — sometimes traveling at more than 1.6 million km/h (1 million mph), which is about 10 times faster than ordinary star movement. After the star escapes from our galaxy’s confines some 1 trillion years in the future, it would continue to travel away from our galaxy into interstellar space, effectively becoming the most distant source of light from beyond our galaxy’s borders. Any observer would be surprised to see the star accelerating more and more quickly as it made its way into oblivion. Then they would witness it disappear over an “event horizon” beyond which information can no longer be received because of the rapid expansion of space, a product of dark energy. Yes, it would take an extremely long time to see this play out, but it’s not like the universe will be teeming with things that warrant close investigation. Besides hypervelocity stars, other sources of information may exist in the future, clues that can help unlock important information about the standard model of cosmology and, essentially, the creation of the universe itself. Under this scenario, dark energy continues driving the expansion of the universe, resulting in temperatures dropping throughout the universe until it reaches absolute zero (or a point at which the universe can no longer be exploited to perform work). Similarly, if the expansion of the universe continues, planets, stars, and galaxies will eventually be pulled so far apart that stars will lose access to the raw material needed for star formation, and thus the lights will inevitably go out for good. This is the point at which the universe would reach a maximum state of entropy. Any stars that remain will continue to slowly burn away until the last star is extinguished. Instead of fiery cradles, galaxies will become coffins filled with remnants of dead stars. It has been said that, in the very distant future, intelligent civilizations will look into the sky and think they are well and truly alone. At that point, they probably are. We can’t predict for sure how the universe will be shaped over the course of the next hundred billion years and beyond, but we can hope that future creatures on a distant planet in the Milkdromeda galaxy will have knowledge of a little blue planet named Earth. It’s too bad you and I won’t be here to see it, but we each play a role in the story of Earth and the history of a little species known as homo sapiens. “So Long, Phobos. Mars Gets Rings” Image Credit: OuterSpaceUniverse.org. Edits made by From Quarks to Quasars. “The Blue Marble” Original Image Credit: NASA Goddard Space Flight Center / Reto Stöckli (land surface, shallow water, clouds). Enhancements by Robert Simmon (ocean color, compositing, 3D globes, animation). Data and technical support: MODIS Land Group; MODIS Science Data Support Team; MODIS Atmosphere Group; MODIS Ocean Group Additional data: USGS EROS Data Center (topography); USGS Terrestrial Remote Sensing Flagstaff Field Center (Antarctica); Defense Meteorological Satellite Program (city lights). Edits made by From Quarks to Quasars.